annars värt varenda krona du ger för den idag. Här kan du se bilder på insidan två våningar. Det är inte utan anledning T531 är en av NADs riktiga storsäljare. Det var en DVD-spelare som inte kostade en förmögenhet, men som hade kvaliteter som man oftast bara brukar hitta i dyrare lösningar ? och det gällde både för hemmabio och musik. T532 är faktiskt ännu bättre. Detta är definitivt en DVD-spelare som du bör titta närmare på om du funderar på att byta ut din CD-spelare mot en DVD och få samma ljudkvalitet som tidigare. I have owned this little gem since 2003 - this was the DVD player that replaced my family's Sony Playstation 2 which we previously used for our DVD player. It was the centerpiece of our little theater 2 channel "theater" until I went upscale to a Krell HTS and Denon 3910. Then I moved it into our bedroom where I used it until this year (2012) when I replaced it with a Sony BDP-2000ES (otherwise, I would have kept on using it). Picture via component out is simply outstanding when viewed on my 27-inch TV followed by the 40-inch Panasonic Viera LCD flat panel. Two channel audio was superb as well (and all I really needed for the bedroom TV) although decoded surround (admittedly via the Krell HTS 1) was also superb for a DTS/Dolby player of standard DVDs. Ergonomics were excellent as well - the remote was easy and intuitive. It decoded MP3s burned to CD (although I had precious few of these). It has really held p well over the years and stands up suprisingly well to the test of time. Sure it isn't Blu-Ray, but for CD and DVD playback in a bedroom system (or especially used as a transport for an AVR/Pre-pro), it has been a joy to use for nearly a decade! I've owned this player for at least 4 years now. Video quality is excellent. Sound quality is excellent, though not quite in the same class as the comparable NAD CD player. One thing I've recently discovered - and no one seems to review - is that the DVD player also has the option of a 96Khz audio signal, which is still state of the art today. I've noticed a very pleasant improvement in using the 96Khz audio option. 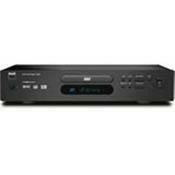 I couldn't find a better DVD player in this price range, which is why I bought a NAD DVD player. The same goes for all their equipment.. Good stuff, decent price, great value. Sound. DTS and DD never sounded so good. Picture quality is also very good. trivial, i won't mention them. First week i have the damn thing and it brakes down.... really worthless crap. I should have known after reading the reviews of the T 741 reciever. NAD is on a return I'm afraid. Good design though, but design is not very important when the player is just sitting here doing NOTHING. Keeps saying "No disc", tried many discs, but had no succes..... Last time NAD for me.